Unfortunately the audition episode of Hollywood Rodeo appears to be the only surviving episode. This is a product of the "Singing Cowboy" Western Movie era, but also an artifact of Home front Life during WWII. Hollywood Rodeo is very similar in format and content to the later All Star Western Theater. Tex Ritter would be an occasional guest on the later show. Rodeo was conceived as a tribute to the modern Cowboy. 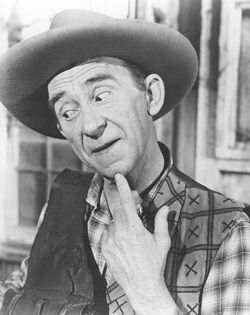 Never mind that from the Hollywood's perspective a cowboy often had to be as good with his guitar as his rope and saddle. 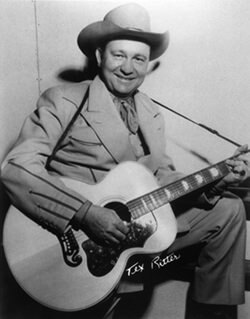 Tex Ritter got his show-biz start singing Cowboy Songs over Texas AM Radio. By 1932 he was appearing on The Lone Star Rangers, New York City's first Western Radio program, as well as appearing in Broadway shows. In 1936 he moved to Los Angeles and found work in B Westerns; he later moved to Universal Pictures. In 1942 he became the first artist singed by Capitol Records. Hollywood Rodeo imitated a Rodeo format. Coming out of "Chute One" was the "Buckaroo Quizaroo" that gave members of the studio audience a chance to win War Stamps. Later is an interview with guest star, Hollywood Stuntman Yakima Canutt, followed by a short drama about a Rodeo whose gate money had been stolen. Whenever the action slows for a moment it is filled with Cowboy music and comedy by sidekick Soapy Jones. A particular tug at the heart-strings is the song "There's a Gold Star in Her Window" about a Mother's sacrifice during Wartime. Roscoe Ates, having overcome a terrible stuttering problem, began show-biz as a concert violinist, but soon realized there was more money in Vaudeville. He would be involved in many films, fifteen of which featured his Soapy Jones character. Be the first to comment on "Hollywood Rodeo"